Zürich, April 16th 2004 - The Cameroon National Football Team was fined with a six point deduction from its 2006 World Cup qualification campaign. In addition the Cameroon Football Association has also been fined CHF 200.000. These FIFA sanctions were imposed as a consequence of Cameroon’s failure to comply with the equipment requirements on the field. The “SAVE-THE-GAME” –project is an appeal protesting against the current disciplinary ruling against Cameroon by the FIFA. The Initiative demands the withdrawal of the sanctions! 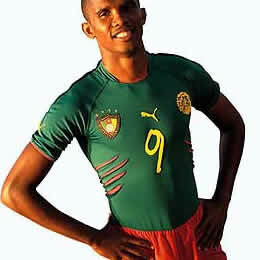 The National Football Team of Cameroon recently appeared at the 2004 African Cup of Nations (quarterfinals) in a newly designed one-piece playing kit (aka Cameroon UniQT). According to the FIFA this behaviour is to be seen as a violation of Law 4 of the FIFA “Laws of the Game”. Although Law 4 pins down the rules for international playing-kit standards on the field – shirt, shorts and socks – the current disciplinary ruling against Cameroon is without merit and has no precedent in the world of football. If the FIFA should decide to keep up the current disciplinary ruling against Cameroon, the team hardly has a chance to pass the 2006 World Cup qualification campaign. The aim of the campaign is to collect at least 1 million online votes for Cameroon’s National Football Team. These are to be handed on to the FIFA-Officials in Zürich/ Switzerland in autumn 2004. Your voice can support the campaign: 1 Million Voices for Cameroon!